As populations and aspirations grow, so does the demand for materials and resources to support them. Although such resource demands were once satisfied by local and regional hinterlands, they are becoming increasingly global in scale and reach. This phenomenon has generated material flows that are trans-continental and planetary in scope, and has profound consequences for the sustainability, functioning, sense of ownership and identity of future cities. However, the global concentration of the construction industry on a selected few mined materials puts high pressure on our natural resources. If we talk about the future city, it becomes clear that it cannot be built with the same finite resources. The 21st century will face a radical paradigm shift in how we produce materials for the construction of our habitat. The linear concept of “produce, use, and discard” has proven itself unsustainable in the face of scarce resources and exponentially increasing urban populations. Instead, to achieve a cycle of production, use, and re-use, we must explore alternative materials and approaches to construction. The Professorship of Sustainable Construction Dirk E. Hebel at the Karlsruhe Institute of Technology and the Block Research Group (BRG) at the Swiss Federal Institute of Technology (ETH) Zürich are combining their knowledge in materials, construction, structures, and geometry to address the problems posed by inefficiency in the realms of current design and material use. Utilizing the regenerative materials mycelium and bamboo and a design based on polyhedral form and force diagrams controlling the geometry of the structure’s forces, this exhibition presents a full-scale vision for how we may move beyond the mining of our construction materials to their cultivation and urban growth. It suggests ways that efficiency of digital design and engineering and alternative resources can join forces to question current practice and propose more sustainable approaches. Mycelium is the root network of mushrooms, a fast growing matrix that can act as a natural and self-assembling glue. Digesting plant-based waste products, such as saw dust, mycelium’s dense network of hyphae binds the substrate into a structurally active material composite. The advantages of such products are significant: As mycelium follows a metabolic cycle, building elements or whole constructions may be composted after their original use. The material may be grown locally, reducing both the energy and time required with transportation. And, as they are organic matter, they act to reverse carbon emissions through the absorption of carbon. 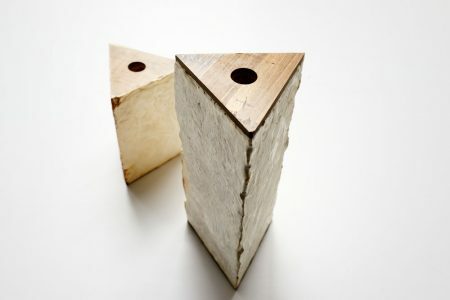 Mycelium based materials offer significant ecologic advantages on one hand but offer a comparably low structural strength on the other. When building with such weak materials, good geometry is essential for maintaining equilibrium through compression only. Such so-called funicular geometries have the advantage that their internal stresses are very low. While current conventional development of engineered materials, such as e.g. concrete and steel, is largely focused on making materials stronger by increasing their allowable stress, achieving stability through geometry instead allows the use of weak materials, such as mushroom mycelium, in structural applications. We believe that local, regenerative and cultivated resources in combination with informed structural design, have the potential to become a very real alternative to established materials within the building industry.